From the 1784 French police directive requiring prior authorization for balloon flights to the complex international system of standards and recommended practices, certification and licensing that we have today under the Chicago Convention of 1944 and the International Civil Aviation Organization (ICAO), aviation law has progressed rapidly in line with advances of technology. Nevertheless, the basic principle of airspace sovereignty – by which each state has exclusive jurisdiction over the airspace above its territory – has remained the underlying foundation of national aviation legislation and international aviation agreements. This publication cites significant legislation and court rulings, including from the United States and the European Union, where far-reaching measures on market access, competition and passenger rights have set trends for other regions of the world. The special case of Latin America has a chapter to itself. At a time when commercial aircraft have been used as lethal weapons for the first time, aviation law finds itself in the front line of responsibility for maintaining global aviation security. For these and other reasons, this book will be of great value to the aviation law community, in particular the aviation law practitioner, airline lawyer, government regulator, and academic teacher and researcher of aviation law. Chapter 1. Introduction - E.M. Giemulla. Chapter 2. The Structure of Aviation Law - E.M. Giemulla. Chapter 3. International Organizations - L. Weber. Chapter 4. From Regulation to Deregulation - E.M. Giemulla, H. van Schyndel. Chapter 5. Rights in Aircraft - L. Weber. Chapter 6. Liability in International Law (Private Air Law) - E.M. Giemulla, H. van Schyndel. Chapter 7. Aviation Security - L. Weber. Chapter 8. United States Air Law in the 21st Century: Challenges from the EU and Elsewhere - A. I. Mendelsohn. Chapter 9. Latin American Aviation Law and Organizations - A.M. Donato. Chapter 10. 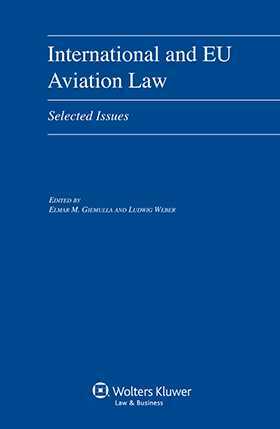 European Community Aviation Law and Organizations - E.M. Giemulla, H. van Schyndel.